Which companies offer the best AD&D policies? Below is TermLife2Go’s list of the top five accidental death and dismemberment insurance providers. If you still have questions about AD&D after reviewing our list, check out our overview of AD&D insurance or our FAQ. Aflac is our top choice because of its excellent service and how easy it is to use. More than 50 million people count on Aflac for their supplemental insurance needs. In addition to serving a massive demographic—offering both individual and group AD&D coverage—Aflac also boasts an impressive A- financial score from both A.M. Best and Standard & Poor’s (S&P).1 Although Aflac earned a small percentage of complaints with the National Association of Insurance Commissioners (NAIC) last year (0.38)2, those amount to a small fraction of dissatisfaction when compared to the number of policies Aflac services. These factors alone would put Aflac comfortably at the top of our list, but we also applaud how easy Aflac makes it to file and manage a claim. If policyholders submit the pertinent information using Aflac’s online SmartClaim® platform before 3 p.m. (EST), benefits are usually paid in one business day. Read our review to find out more about Aflac. Mutual of Omaha’s excellent financial ratings offer customers long-term security and peace of mind. Mutual of Omaha not only offers stellar financial ratings (an A+ from AM Best and an AA- from S&P) but also had no NAIC consumer complaints filed in 20171. Mutual of Omaha’s AD&D policies cover people ages 18–70 with up to $500,000. (Most AD&D policies stop at age 60 and top out at $300,000.) In some instances, your beneficiaries may receive a larger settlement if you die in a common carrier accident (e.g. while traveling in a bus, airplane, or passenger train) or are killed by another motorist. Read our full review to learn more about Mutual of Omaha. Sun Life’s unique offerings includes coverage for things other providers typically don’t cover. Like the other companies included on our AD&D shortlist, Sun Life Financial offers stable financial rankings, including an A+ from AM Best and an AA- from S&P1. These ratings aren’t surprising considering this Canadian company is one of the world’s largest insurance providers. Sun Life’s AD&D coverage goes above and beyond by offering full coverage for the loss of speech, hearing, or even a thumb or finger. Also worth noting: Sun Life earned only three AD&D-related complaints with NAIC in 2017. The downside of Sun Life is the company’s focus on group packages. Individuals seeking one-off AD&D coverage may find Sun Life policies costlier than other plans on the market. Read our full review to learn more about Sun Life. Gerber’s extended AD&D coverage makes it one of the top providers to consider. Gerber’s AD&D products outpace industry standards. For instance, Gerber offers up to $250,000 coverage to anyone until age 69. (60 is often the norm for other companies.) And like many providers, Gerber pays full benefits if you lose both hands, both feet, or vision in both eyes. However, Gerber’s coverage goes further in that it offers full benefits to individuals who lose any two of those body parts in a single accident. Like most other providers, Gerber pays only a 50% payout if a single hand, foot, or eye is lost in an accident. But the company’s financials—A+ from AM Best and AA- from S&P1—make Gerber an AD&D standout. Read our full review of Gerber’s offerings to learn more. Farmers has some of the most availabale and affordable AD&D policies. Farmers’ AD&D coverage starts at $50,000, meaning policies can be purchased for less than $8 per month. And you can rest easy knowing Farmers is on solid financial ground—Farmers does business in all 50 states, has been around since 1928, and consistently earns high ratings from A.M. Best and S&P. Additionally, Farmers’ insurance process has no waiting period; coverage is effective with your first payment. If there is a downside to Farmers’ AD&D, it’s that coverage caps out at age 59. So if you’re seeking protection into your retirement years, you’ll probably want to find another provider. Read our full review of Farmers life insurance offerings to learn more. If longevity and innovation are important to you, look no further than Lloyd’s of London. Lloyd’s has specialized in unique policies for more than 300 years. It was Lloyd’s, after all, that pioneered automobile insurance (or “motorcar coverage” as they called it when they introduced it in 1904). Since then, Lloyd’s gained fame by insuring an array of celebrities, astronauts, and even international landmarks. So it should be no surprise it offers innovative AD&D coverage. For instance, assuming you can afford $300,000–$400,000 in annual premiums, you can purchase a $100,000,000 policy from Lloyd’s. Not sure where to start with AD&D insurance? 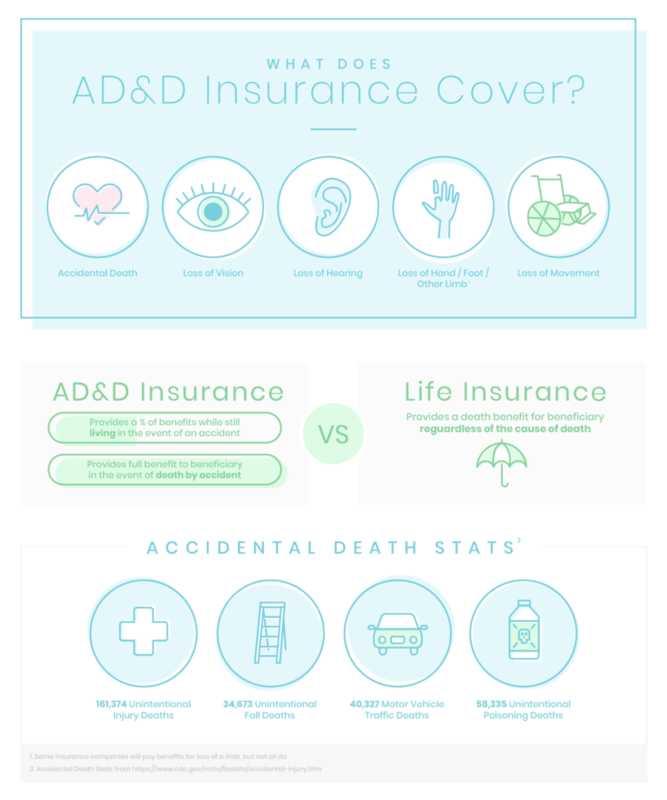 Here’s an overview of what AD&D insurance means, what it covers, and whether you need it. Accidental death and dismemberment insurance is specialized coverage. Unlike some policies that can confuse consumers, AD&D acts as advertised: it offers financial protection in the event of accidental death or a disfiguring accident. At a high level, AD&D comes in two types: Accidental Death pays your beneficiaries if you die in an accident. The second type—Complete AD&D—enhances coverage by paying you in the event of certain dismemberments (such as losing a limb). AD&D insurance is a specialized insurance that pays your beneficiaries if you die from an accident, like a car crash. It even covers unusual events such as an unintentional poisoning or a machinery accident. The dismemberment portion of a policy pays you cash benefits if you lose a limb, your vision, or your hearing due to an accident. Keep in mind: AD&D doesn’t cover death by natural causes, which accounts for the majority of deaths in the US. AD&D can be bought as stand-alone coverage, or it can be a rider to traditional health or life insurance. But just because it’s inexpensive doesn’t mean it should be treated as a substitute for traditional life insurance. AD&D offers narrow, specialized coverage that may leave your loved ones unprotected. If you’re looking for full coverage, consider a traditional term life or whole life insurance policy instead. Certain events can result in higher payouts. Coverage varies, but most AD&D policies pay out 100% of the policy’s value in the event of accidental death. Permanent disability due to an accident typically results in 100% payout as well. The dismemberment side of a policy (loss of limbs, vision, hearing) varies per provider. Most offer 100% payout if you suffer a complete loss of vision, but losing sight in a single eye or losing the ability to speak or hear usually results in a 50% payout. Because accidents are not the only cause of death, accidental death insurance should not serve as your primary life insurance. If you are considering an AD&D policy because you’re concerned about failing a medical exam, we encourage you to look into a no exam life insurance policy. We get it. We’ve given you a lot to mull over. If you still have insurance questions—or want to chat with a licensed insurance agent—give us a call at (888) 234-8376. Is AD&D insurance worth it? Yes. Accidents are the third-leading cause of death in the US, so having an extra layer of protection may be a comfort to loved ones. Tina Willis, an accidental death lawyer in Florida, reminds her clients that it’s common for some accidental deaths, such as a car crash due to negligent driving, to leave a family financially destitute—especially if it was a family member who triggered the accident. Can an AD&D policy replace life insurance? Using accidental death insurance as your only form of life insurance is risky. AD&D doesn’t pay out for deaths by natural causes, critical illness, or disease, so heart attacks, cancer, strokes, and other common causes of death aren’t covered. However, if you already have a life insurance policy, revisit the policy’s coverage. It’s common for life insurance to include AD&D coverage. Should people with chronic health issues buy AD&D insurance? It’s not ideal, but accidental death insurance may be worth considering even if you have serious medical issues. If a preexisting conditions prevents you from purchasing a life insurance policy, AD&D may be better than having no life insurance at all. Who should get accidental death insurance? Anyone with a hazardous occupation, such as working with heavy machinery, should think seriously about buying AD&D coverage. But if your occupation is the main reason for your purchase, be sure to read the policy carefully before buying. Some AD&D providers won’t cover death or injuries incurred during military service or brought on by high-risk activities. So, if you’re a soldier or a professional skydiving coach, you may need to seek out specialized coverage. And if extreme sports are your thing, know that insurance companies typically reject claims related to risky activities like bungee jumping. Even if you earn a living in a relatively risk-free role, you should still consider AD&D. For instance, if you are a salesperson who spends a lot of time driving, AD&D can cover losses from injury or death while traveling. Next Post: How much does life insurance cost?